Fantasy and science fiction writer, Eli Celata is on a race against the calendar year to set out 12 books in 12 months. Can she do it? 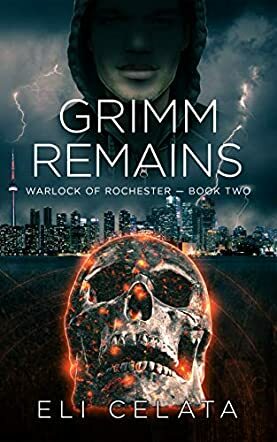 Grimm Remains by Eli Celata is book two in the Warlock of Rochester series. Following Mammon's summoning, the town of Rochester has become a beacon for demons. As Jon settles into another academic year, his training with Jordan is frustrating as his mentor remains secretive and evasive about details regarding the whereabouts of Jon's father. His education, both magical and academic, is put aside when demonic mermaids called Havfine swim upstream from Lake Ontario with the intent to drown mortals, and the Wizard Monday seeks their aid when orphans go missing from a magical sanctuary in Toronto. As they struggle to find the demon responsible, Jordan's past with Jon's father comes to light, revealing secrets and surprises that Jon doesn't see coming. Eli Celata once again enthralls readers with Jon's story, striking the perfect balance between his real life and his magical one, often with humorous consequences. The banter between Jon and Jordan is delightful, while his relationships with his friends keep him grounded. It's refreshing that Jon's ordinary life isn't forgotten or pushed aside, instead his struggle to keep magic secret and to find time for his friends and homework is addressed. Celata's characters feel like real people that just happen to deal with demons and possess magic. Jon has grown since High Summons, but it's clear that this is just another step for him to take to become the hero he's meant to be. Celata once again charms with Jon's voice. Grimm Remains is a coming of age story full of heart, emotion, magic, and adventure.